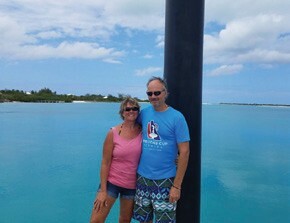 Editor’s note: This is the third installment in a series of dispatches from Linda and her husband, Captain Bob Damiano, who are finishing up the island portion of their one-year sailing voyage aboard their Tartan 4000 Argon. Readers of our Caribbean sailing experiences this past winter know that we have especially enjoyed some of the less traveled, more remote islands. Thus I was not deterred by the obviously more technical sailing required by the extensive reefs and shallows around Turks & Caicos (TCI). Even the occasional critical comment (in person or online) from fellow cruisers did not deter me from wanting to experience the country’s pristine waters, unique coral, copious wildlife, and extensive beaches. Bob: Where the heck do we land the dinghy? Linda: Wow, this water is beautiful! Bob: I’m exhausted. Damn, where’s the customs office? Linda: The turquoise colors are intoxicating! Bob: You mean we have to anchor on a ledge a few boat lengths from 2,000 feet of water?! Linda: The snorkeling is fantastic! Linda: I love this secluded paradise. Bob: I’m taller than this godforsaken island. There is no wind protection in any of these so-called anchorages. Linda: This expansive area behind the reefs is a breathtaking place to drop the hook. Bob: Holy crap, this place is expensive! Linda: The boys will have so much fun here! 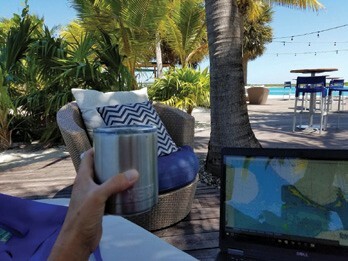 TCI is often just a quick overnight rest stop for cruising sailors transiting northward to the Bahamas from Puerto Rico or Dominican Republic, or southward to the Virgin Islands from the Bahamas. Most do not stay long; we learned why. TCI is an extremely flat country consisting of 300 islands located south of the Bahamas and north of the Dominican Republic and just not well set up to receive cruisers. Only eight of the TCIs are formally populated. These low, flat, limestone landmasses have extensive marshes, mangrove swamps, and well over a hundred miles of beaches. 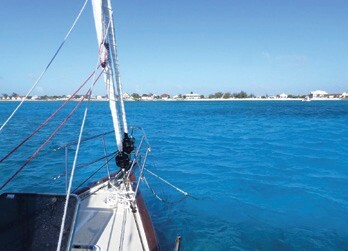 Most of the TCI is guarded by beautiful yet prohibitive reefs and sandbars. These precarious shallows, along with no wind protection from the low lands, do not make for easy sailing of a 6-foot draft vessel and offer very little protection from wind. Dinghy docks are non-existent, and there are no basic services (provisioning, trash disposal) easily accessible from any of the anchoring options. TCI has a population of about 30,000, with vast majority residing on the island of Providenciales (Provo). The weather cannot be beat…it is usually sunny and dry (30 inches of rain annually resulting in fresh water being a precious resource) with comfortable temperatures between 75 and 85 year round. Conditions for the passage from Puerto Rico to Grand Turk started off mild and easy enough, but soon picked up keeping us busy through building winds, seas and eventually strong squalls during the two and a half days. The two nights during the passage were long and difficult, with robust winds and seas and scant moonlight. This was the first time we had to suit up in foul weather gear in many months. Waves were on our side, with several giving us, the deck and the cockpit a good washing. We set anchor on the open, exposed western shore of Grand Turk just after daybreak. Turks consists mainly of Grand Turk and Salt Cay. Grand Turk is a small island (only about 5 miles north to south and less than 2 miles east to west). Although small and sparsely populated compared to the Caicos region of the country, it is the government center. This is where we had a frustrating (and expensive) welcome getting to and clearing customs and immigration after the difficult transit from San Juan. There was no dinghy dock and we struggled to safely beach. Then we walked back and forth in the heat trying to find the customs office, only to then be told we had to pay the $350 in cash. That required additional walking to an ATM (with mega added fees). Not exactly a positive welcome…but the water is so beautiful! Caicos is the group of islands that most people associate with TCI, especially the most populated island of Providenciales, known as Provo, that is home to 80% of the population plus the destination for most tourists. 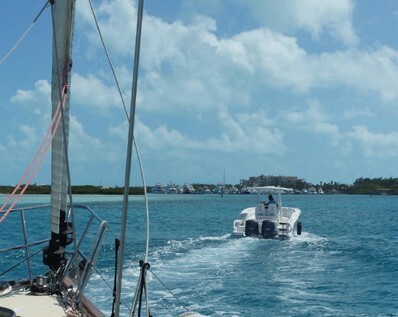 Caicos also includes of the islands of Middle Caicos, North Caicos, South Caicos, West Caicos and Parrot Cay. After just a couple nights anchored off Grand Turk, we needed to continue on to the Caicos region in preparation for even higher winds later in the week. We left well before dawn to be sure of arrival in daylight at an anchorage on the north side of Providenciales in order to safely navigate the shallow and unfamiliar reefs. We had planned to stay at Blue Haven Marina (BHM) for several days while our kids came for a visit. We ended up needing to duck into the marina earlier than planned due to the forecasted winds with no good anchoring options. We also had to stay at the marina longer than planned due to the wind and then waiting for a new refrigerator pump. BHM is an excellent marina and extensive resort, but our unexpectedly long stay most definitely busted our cruising budget for the month…Cha-ching! In addition, everything on TCI is very expensive: $30 for pump out, $35 for one load of laundry, $20 per person for a short cab ride (we ended up renting a car for 10 days), $8 for a box of cereal, and $40 entrees at most restaurants. We bled money for most of the three weeks. If you’re looking for pristine beaches with silky sand, the clearest water punctuated by ribbons of different hues of blue, are not worried about your spending rate, and fine with non-exotic American culture, Turks & Caicos is a fantastic country to visit. However, for cruising sailors on a budget, requiring access to standard services and craving island flavor, there are many other places that will fill the bill. If we ever return, it will either be for just a quick rest stop to break up a long passage (as most sailors do), or perhaps (gasp) arriving by plane and exploring via land and with a big credit card. Argon will soon sail offshore to North Carolina before heading northward up the coast to New England. 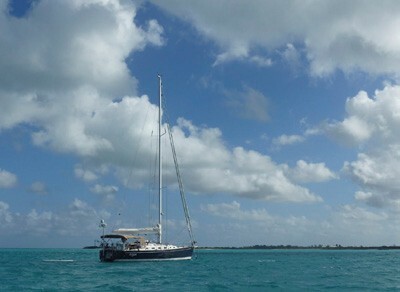 You can follow Linda and Bob’s journey (and view their very well produced videos) at ArgonSailing.com.